Videos, so many videos! As like my last post, the availability of video is a great asset for teaching and there are ways that we can manipulate video to be more useful for our students. Last time I discussed Vibby as a way to create shorter clips from video. In this blog I introduce EDpuzzle a tool for embedding questions into video. Why might instructors choose to embed questions into videos? There are probably two main reasons: 1) to check a students understanding and 2) to simply make sure they watched the video. Edpuzzle provides a free and easy method for doing both. EDpuzzle allows faculty to import any video (URL link, files), clip videos down, provide your own audio narration, and to embed questions. If you create a class in EDpuzzle (students sign up for free and can self enroll into courses making the work on your end as simple as sending an e-mail with a link) you can view the progress of your students in terms of how much of the video they actually watched and how they performed on the questions. Additionally, instructors can select options that make it impossible to skip forward in the video (so students actually have to let the video run. Here is an example of an EDpuzzle video that you can try. EDpuzzle can be integrated into Moodle by embedding it onto a page in Moodle or linking from Moodle. However, there is not currently an integration with Moodle gradebook. So if you want to have the EDpuzzle scores a part of your Moodle gradebook, this will need to be done manually. 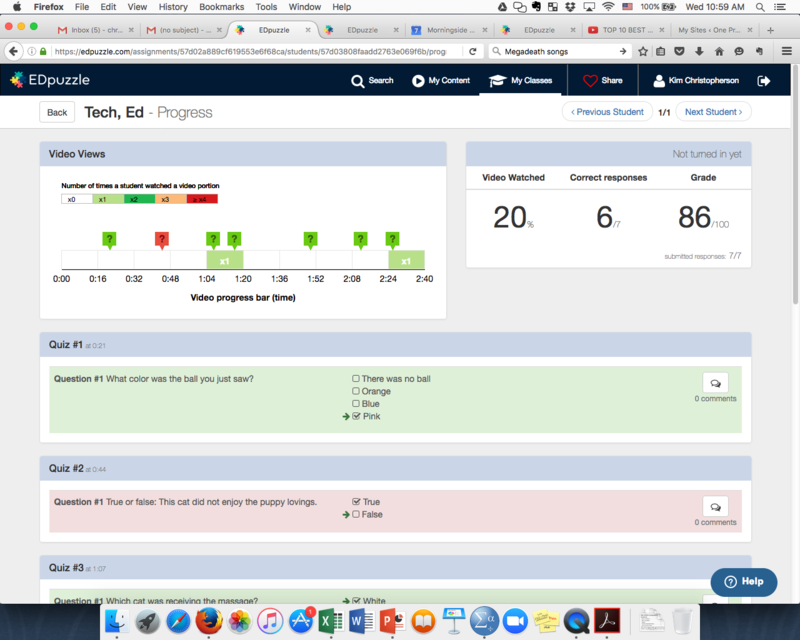 EDpuzzle can help students engage more with the video and for instructors to track student progress. Best of all, it’s quite easy to use. This entry was posted in Uncategorized on September 7, 2016 by christopherson.